For other uses, see Lift. Lift is a meteorological phenomenon used as an energy source by soaring aircraft and soaring birds. The most common human application of lift is in sport and recreation. The three air sports that use soaring flight are: gliding, hang gliding and paragliding. In dynamic soaring it is also possible to gain energy, though this uses differences in wind speeds rather than rising air. Thermals are columns of rising air that are formed on the ground through the warming of the surface by sunlight. If the air contains enough moisture, the water will condense from the rising air and form cumulus clouds. Thermal lift is often used by birds, such as raptors, vultures and storks. Although thermal lift was known to the Wright Brothers in 1901, it was not exploited by humans until 1921 by William Leusch at the Wasserkuppe in Germany. It was not until about 1930 that the use of thermals for soaring in gliders became commonplace. Once a thermal is encountered, the pilot flies in circles to keep within the thermal, so gaining altitude before flying off to the next thermal and towards the destination. This is known as "thermalling". Climb rates depend on conditions, but rates of several meters per second are common. Thermals can also be formed in a line usually because of the wind or the terrain, creating cloud streets. These can allow flying straight while climbing in continuous lift. When the air has little moisture or when an inversion stops the warm air from rising high enough for the moisture to condense, thermals do not create cumulus clouds. Typical locations to find thermals are over towns, freshly ploughed fields and asphalt roads, but thermals are often hard to associate with any feature on the ground. Occasionally thermals are caused by the exhaust gases from power stations or by fires. As it requires rising heated air, thermalling is only effective in mid-latitudes from spring into late summer. During winter the solar heat can only create weak thermals, but ridge and wave lift can still be used during this period. Ridge lift, or Orographic lift, is caused by rising air on the windward side of a slope. Ridge lift is used extensively by sea birds and by aircraft. In places where a steady wind blows, a ridge may allow virtually unlimited time aloft. With winds of 20 to 25 knots (46 km/h), it is possible for aircraft to soar at an altitude up to twice the height of the obstacle. Ridge lift can also be augmented by thermals when the slopes also face the sun. Lee waves occur when a wind of 25 knots (46 km/h) blows over a mountain. 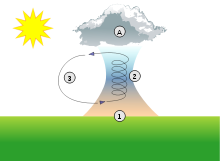 Provided that there is a steady increase in wind strength with altitude without a significant change in direction, standing waves may be created. They were discovered by a glider pilot, Wolf Hirth, in 1933. These waves reach heights much greater than the original obstruction and so can permit gliders to climb to the stratosphere. Pilots use supplementary oxygen to avoid hypoxia because gliders do not have pressurized cockpits. This lift is often marked by long, stationary lenticular (lens-shaped) clouds lying perpendicular to the wind. A mountain wave was used to set the record for highest altitude by a glider when Steve Fossett and Einar Enevoldson, wearing pressure suits, soared to an altitude of 50,699 feet (15,453 m) on August 29, 2006 over El Calafate, Argentina in their modified DG-505. The current world distance record of 3,008 km (1,869 statute miles) by Klaus Ohlmann (set on 21 January 2003) was also flown using mountain waves in South America. Birds have been observed using wave lift to cross mountainous regions. The boundaries where two air masses meet are known as convergence zones. These can occur in sea breezes or in desert regions. A sea-breeze (or onshore breeze) is a wind from the sea that develops over land near coasts. In a sea-breeze front, cold air from the sea meets the warmer air from the land and creates a boundary like a shallow cold front along a shear line. This creates a narrow band of soarable lift with winds as light as 10 knots (19 km/h). These permit the gaining of altitude by flying along the intersection as if it were a ridge of land. Convergence may occur over considerable distances and so may permit virtually straight flight while climbing. In dynamic soaring energy is gained by repeatedly crossing the boundary between air masses of different horizontal velocity rather than by rising air. Such zones of high "wind gradient" are usually too close to the ground to be used safely by gliders, but Albatrosses and model gliders use this phenomenon. A pilot can create an indication of lift on uncompensated instruments by entering a climb by pulling back on the stick (hence “stick thermal”). This is not true lift because the increase in potential energy of the aircraft is achieved from decreasing airspeed rather than the result of flying in rising air. Gliders are equipped with instruments that are compensated to prevent indications of stick thermals but the phenomenon is evident in aircraft whose compensation is inadequate. ^ "Diagram of thermals". Archived from the original on 2006-07-18. Retrieved 2006-09-05. ^ "Duration record". Retrieved 2006-08-24. ^ "Diagram of ridge lift". Archived from the original on 2006-07-18. Retrieved 2006-09-05. ^ "Diagram of wave lift". Archived from the original on 2006-07-18. Retrieved 2006-09-05. ^ "Fossett, Enevoldson Bringing Record-setting Glider to EAA AirVenture Oshkosh 2007". Retrieved 2011-11-15. ^ "Distance record". Archived from the original on 2008-03-11. Retrieved 2006-08-24. ^ "Morning Glory". Archived from the original on 2006-08-25. Retrieved 2006-09-27. This page was last edited on 11 December 2018, at 15:53 (UTC).